pH Paper consists of a .5" by 50' roll of pH paper, packed in a plastic dispenser with an extra large color chart for easy color matching. Provides for approximately 300 tests. PH Paper puts you in control of knowing how you are progressing towards a better state of health and vitality. pH Testing - Breakthrough in Health! In this write-up we are going to show you how to test a body's state of pH and use this knowledge to guide your actions in creating wellness for yourself and others. First, what is pH? Body pH refers to the degree of acidity (sourness) or alkalinity (bitterness) of the body's fluids and tissues. Food, exercise, toxins, long-term deficiency of necessary nutrients (especially minerals), and stress are some of the factors that affect the body’s acid or alkaline condition. In a diseased state, the body’s pH is almost always out of whack. Physical health can be assisted by adjusting factors that disturb the balance of acid-alkaline. Different processes of the body need different pH: an acid or an alkaline state. For example, in the digestive system the stomach functions when it makes acid, while as soon as the food leaves the stomach, alkaline fluids from pancreas and liver/gall bladder are squirted into the food matter to change its pH so proper digestion and absorption can occur in the small intestine. pH is a factor in all processes of the body, including inside the cells, because the body is a biochemical organism - so everything from the creation of physical energy, to enzyme function, sugar metabolism, hormone response, movement of wastes out of the cells and many other functions are affected or regulated by pH level. Acidity is expressed on the pH scale, in which 1.0 is a very low pH and strongly acid, 7.0 is neutral, and above 7.0 is alkaline, going up to 14. The pH in the active stomach is 2.0 to 3.0, while the pH in the small intestine is generally between 7.5 - 8.0. Blood is normally slightly alkaline, with a pH range of 7.35 to 7.45. The blood's acid-alkalinity balance is controlled precisely because even a minor deviation from the normal range can severely affect many organs. All cells, organs and fluids in the body have their own preferred pH values in order to operate at peak performance. These ranges are usually found in the slightly alkaline level. When the pH is pushed higher or lower than the level preferred, the ability of the fluid or cell to do its job is "stressed." It cannot utilize the nutrients it needs, eliminate the wastes collected, etc., until the proper pH is restored. This is where you, the master operator of your body, can make things right using pH testing on a regular basis. 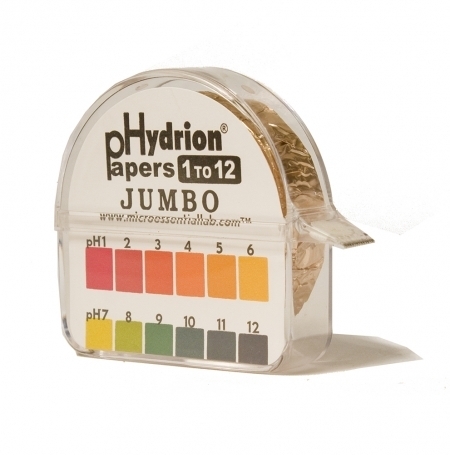 The pH papers register pH values from moderately strong acid pH 5.5 to mildly alkaline pH of 8.0. The thin strip of orange-yellow turns color when it comes into contact with moist or wet acid or alkaline substances. A color guide comes with the pH paper. The number above each color shows the pH value. Testing saliva for pH will give an indication of the body’s overall pH – condition of the liquids in and between the cells. The saliva test is a useful when it is taken first thing in the morning before any food or drink. The pH in the mouth will change with after food eaten, so only the fasting pH (before breakfast) is a valid test of overall conditions in your body. 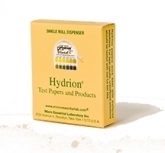 Tear off a strip of pH test paper 1-2" long and hold it below your mouth so that you can spit a small amount of saliva onto an end of the strip. Do not place the test paper in your mouth or on your tongue as this will remove some of the chemical tester and the strip color will be harder to read. Shake the extra spittle off of the end of the strip and compare the change in color of the moistened end to the color chart. Note on a piece of paper, that you can record on from day to day, the number of the pH value. Do this at the very beginning of each day before you have put anything whatsoever in your mouth. This will be your "normal" saliva pH before being changed by things going into your mouth or by the events of the day. Keep this record in a secure and convenient location so that you can record the values on successive days. This is the simplest, most bare bones pH test routine. You just look at the one reading at the start of the day and compare it to the prior day's readings. You are looking for a trend here over a week's time or longer. Ups and downs from day to day are not as important as the trend upward or downward over a consecutive number of days. The trend should move to the ideal range of 7.0-7.4 and then stay there stably as an average. If there is no change or the readings are moving away from the proper range, then you are not doing enough correct actions to improve your health. These values, by the way, can be much affected by emotional and mental states of the individual in response to stress and other factors. Take note if this seems to apply when you evaluate the pH values. This is another reason to watch trends rather than daily changes. 5.5-6.0 State of health is mildly poor or very poor. Anxiety or chronic stress could also be dominating the physiology. If mental/emotional factors are not the cause, improving diet, detoxification and exercise will move the values up to the correct range. 6.2-7.0 Usually indicates that emotional factors are not playing a large role. This range moves more easily with improvement in diet, a detoxification program and some exercise where there was not enough before. "Improving diet" for all those with a pH below 7.0 means eating 70% or more foods from the alkaline-ash* list of foods daily (see below). 7.0- 7.4 The ideal range for pH. Your diet is supplying the minerals you need and stress is not adversing affecting the body, so it can handle its functions. You are building a reserve of alkaline minerals for long-term health and are able to buffer the acids you encounter. Teeth also love when it the pH of saliva stays in this range, as they can remineralize on a daily basis from the body’s healthy alkaline mineral reserve, so long as the diet is adequate in other regards. 7.5-8.0 Diet isn't a major problem unless the pH is consistently above 7.4. Vegetarians commonly fall in this high pH range and can be headed toward exhaustion. The high pH can indicate imbalances in the diet which should be remedied. Worry and anxiety can also cause unusually high pH readings in some people, overriding the positive benefits they get from their good diets. When worry or too much stress is not the case, the physical handling to restore balance is to include more rice cereals and other acid-ash in their diets to tone down the pH. (See acid-ash and alkaline-ash foods list, attached.) Also, mild detoxification and exercise may be of benefit to improve health. So this, in a quick glance, is how you can test and evaluate your body's pH. Monitoring your saliva pH can help you improve your diet and other lifestyle characteristics so that your health can be under your control. After a food has been “burned” (metabolized) by the body it leaves an acid or alkaline residue. 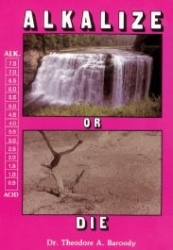 Minerals play a crucial role in determining the acid or alkaline value of the ash which is left. Acid-forming foods leave high concentrations of chloride, phosphorus, or sulfur in their ash. These minerals are used to make acids in the body, such as hydrochloric acid and phosphoric acid. Alkaline-forming foods leave high concentrations of magnesium, calcium, sodium and potassium in their ash, which can be used by the body to make magnesium hydroxide and calcium hydroxide, for example. *Some foods (such as oranges, lemons, grapefruits, and apple cider vinegar, for example) show an acid pH when tested, but turn alkaline during metabolism and leave an alkaline ash in the body. A therapeutic ratio in one’s diet of acid ash to alkaline ash foods would be 90% alkaline to 10% acid until you are well. A maintenance ratio would be 70% alkaline to 30% acid producing foods in the diet for one who is satisfactorily healthy. Drink a quart of fresh squeezed Green veggie/fruit juice a day. Make educated choices with a full list of acid and alkaline-forming foods using this large laminated chart, with information on the back on how to apply this in your diet when you buy The 80% / 20% Alkaline/Acid Chart. Get a fast, fresh start on your health and diet by using Intestinal Cleanse 1 or the Intestinal Cleanse Duo to assist with acid waste and excess mucus removal. Read Alkalize or Die by Theodore Baroody to learn more about pH and health. Science Talk: pH is the chemical symbol for ‘potential of hydrogen’. The element hydrogen combines with other elements to create acids and alkaline substances.